It's common knowledge that men are disgusting. We even disgust ourselves. But we've learned to live with that disgust. Even revel in it. Take flatulence. Now see? You women out there are already rolling your eyes, I can feel it. Yes, flatulence is disgusting. But answer me this: has Whoopi Goldberg ever. Ever. Told a joke as funny as a fart? No, she has not. Okay, so where was I? Well, maybe I was done with that one. See that guy up there bending over? The one with the t-shirt tucked in? Guys who tuck in white t-shirts will generally not fart in public. If they do, they will not laugh out loud or high-five another guy. They might even blush. This guy needs to go out in the woods and bang on a drum. I'll bet you $10 he has a PBS tote bag in the house somewhere. And I would win that bet because I drew him and I can make him do or be anything I want. That's the Power of the Artist. Oh, we may not be able to leap tall buildings in a single bound. Like we're dying to be able to do that. Save, what, ten seconds over just walking past the tall building? But! 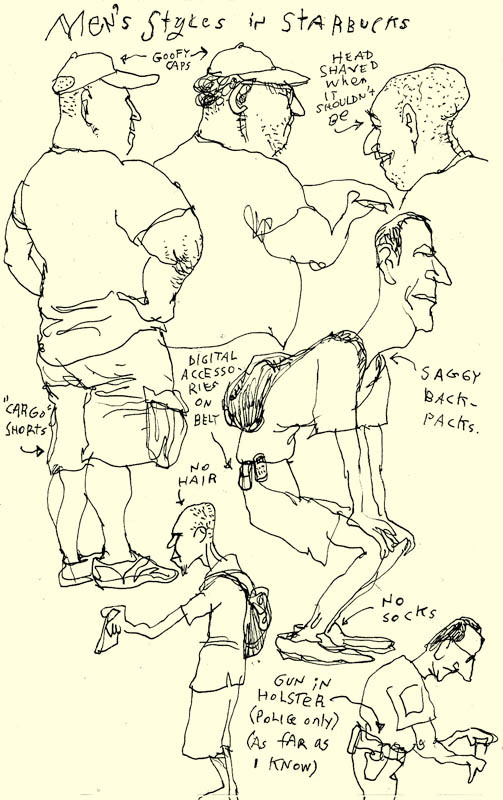 I could draw a poison-tipped spear sticking out of my t-shirt man's back right now. Or I could draw a tiny 1957 Plymouth Fury driving out of his shorts and down his leg. The Power of the Artist. So, friends, if you see an artist coming down the street, give him a wide berth. Preferably on a train to Punta Gorda. And he and a lady friend could lie in that wide berth and dream about little Shetland Sheepdogs who have tiny chewed-up tin globes in their mouths instead of teeth. I think I didn't take my medication last night. I found a capsule on the floor this morning, and it could be last night's. But it doesn't seem to be having an effect.